My doctor put me on work restrictions. What do I need to do? What about my lost wages? When you have a work-related injury or health problem that is so significant that your doctor issues limitations or restrictions on what you can do at work, you need to tell your employer about it. 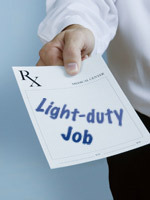 Your doctor would normally outline your restrictions on a form called Report of Work Ability. Once you know your medical limitations, you will need to make sure that you do not continue working or perform any activities outside of your restrictions because it could be viewed as non-compliance with a medical advice, which could ultimately lead to people thinking that your medical problems are not as bad you say they are. After you provide a copy of your restrictions to your work, your supervisor or boss will make a determination if there are any jobs available for you to do safely within your work restrictions. If there are no jobs within your restrictions, or if your doctor takes you off work completely, you will be entitled to receive work comp wage loss benefits from the employer’s workers’ compensation insurance. So long as you cannot work and are recovering from your work injury, workers’ comp will pay you temporary total disability benefits on a weekly or bi-weekly basis – similar to your regular paycheck schedule. The amount of temporary total disability benefit will depend on how much you were making around the time when you got hurt, also known as your average weekly wage. Your temporary total disability (TTD) will generally equal to two-thirds (2/3) of your average weekly wage, and is not subject to taxes. Because there are a lot of minute details in figuring out the correct amount of wage loss benefits, workers’ comp insurance adjusters frequently cut corners and pay less than what the injured workers are entitled to. In some cases, insurance wrongfully denies those benefits altogether. If you find yourself in a situation where you cannot work because of your work injury, or your employer cannot accommodate your work restrictions, and the insurance is not paying you your wage loss benefits, or pays less than it should, you should contact an experienced workers’ compensation attorney at Farrish Johnson for a free consultation about your options or call 507-625-2525 and ask for Yuri Jelokov.